***NEW ROOF WILL BE INSTALLED BY APRIL 1ST. 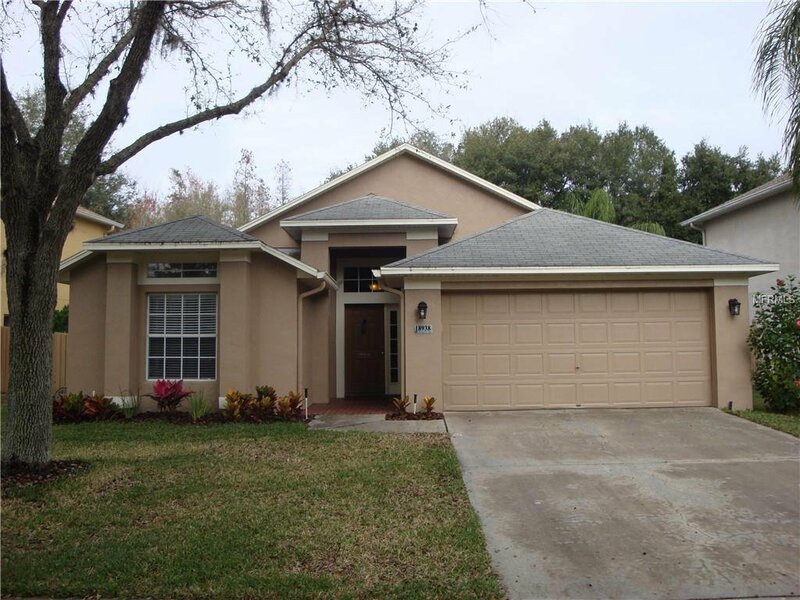 *** BEAUTIFUL 4 BEDROOM, 2 BATHROOM, 2 CAR GARAGE HOME LOCATED IN THE HIGHLY COVETED WEST MEADOWS NEIGHBORHOOD IN NEW TAMPA. THE PROPERTY SITS ON A HUGE 54 X 177 CONSERVATION LOT. THIS UPDATED HOME FEATURES A SPLIT PLAN WITH SEPARATE FORMAL DINING ROOM, SPACIOUS EAT-IN KITCHEN, AND CATHEDRAL CEILINGS. THE KITCHEN BOASTS NEWER MAPLE CABINETS, GRANITE COUNTERTOPS, AND NEWER STAINLESS STEEL APPLIANCES. ARCHITECTURAL DETAILS EVERYWHERE: PLANT SHELVES, WALL NICHES, ARCHES, AND CURVING WALLS. NEW LAMINATE/ENGINEERED HARDWOOD FLOORS THROUGHOUT. THE NEWLY RENOVATED MASTER BEDROOM FEATURES A MASSIVE GLASS SHOWER, NEW DOUBLE VANITY, AND BEAUTIFUL GRANITE COUNTERTOPS. THE SECONDARY BATHROOM HAS BEEN NEWLY RENOVATED AS WELL. THE FAMILY ROOM HAS SLIDERS TO THE EXTENDED, SCREENED PATIO OVERLOOKING THE HUGE FENCED YARD. WATER HEATER REPLACED IN 2016 AND A/C REPLACED IN 2012. GREAT NEIGHBORHOOD, CONVENIENT LOCATION! COMMUNITY CENTER HAS WATERSLIDE POOL, KIDDIE POOL, EXERCISE & SPORTS FACILITIES, TENNIS, ACTIVITIES. PLEASE NOTE: TAXES INCLUDE $1,082 CDD FEES. Listing courtesy of FUTURE HOME REALTY INC. Selling Office: LUXURY & BEACH REALTY INC.